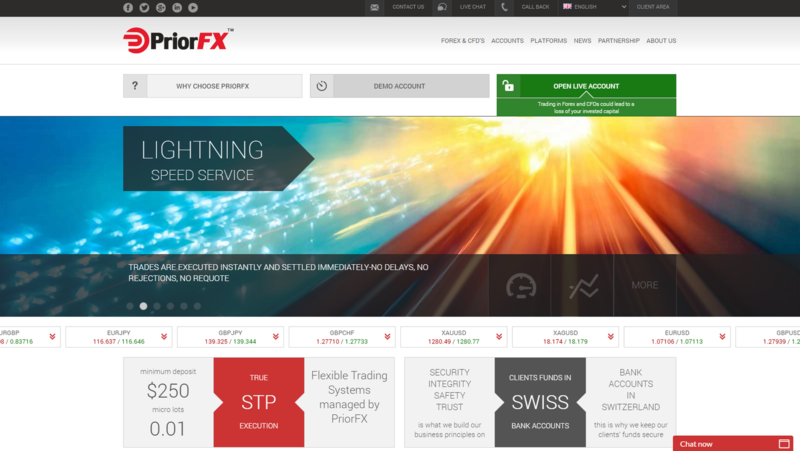 The PriorFX STF broker founded in 2013 offers its clients to trade more than 40 currency pairs, precious metals, commodities, indices, and CFDs on the MetaTrader 4 platform. The brand belongs to the PriorFX Ltd. investment company which is located in Cyprus and registered in the EU. It is also regulated by the Cyprus Securities and Exchange Commission (CySEC). CySEC applies certain rules to Cypriot investment companies. For example, in order to prove their reliable financial conditions, they must have a capital of at least EUR 730,000. In addition, the Commission requires brokers to keep clients' funds in segregated accounts, separately from the company's operating funds. Besides, all CySEC-regulated brokers are members of the Investor Compensation Fund, which can pay compensation of up to EUR 20,000 if the company goes bankrupt. Clients of PriorFX can choose between two account types, Standard or Xchange. The only difference between them is that there is no commission for the Standard account, while the Xchange account has commissions and offers significantly lower spreads. The minimum deposit for both accounts is $250, the maximum leverage is 1:200. Both account types allow micro lots. PriorFX provides floating spreads.The average spread for the EUR/USD pair is about 1.5 pips on the Standard account. Compared with offers of other brokers, PriorFX's spreads are quite standard in the industry. The average spread on the Xchange account for the same currency pair is 0.5 pips. There is also a commission of $8. So, the total costs for trading can be about 1.2 pips per lot. This broker supports the standard MetaTrader4 (MT4) trading platform. MT4 is a world-famous trading platform that offers a full range of trading objects and tools such as more than 50 built-in technical indicators, an expanded package of graphical objects, a lot of advisers and extensive opportunities to test them. Traders can download ready-made strategies or create their own ones. Moreover, EA Programming is available as well. PriorFX's clients can use MetaTrader 4 through PCs and mobile devices. PriorFX cooperates with MyFXbook, which allows customers to copy deals of successful traders. The AutoTrade service is easy to use, so it quickly became popular among traders. One of its various advantages is that clients do not need to install the software to join the Social Trading community. PriorFX offers the following payment methods: credit /debit cards, bank transfer, and electronic payment systems such as Skrill, Neteller, Yandex.Money, WebMoney, Qiwi, and UnionPay China. In addition, customers can use the PriorFX card for depositing and withdrawing funds. The broker accepts USD, CHF, GBP, and EUR. Tambahkan komentar Suku bunga broker lain? I can vouch that PriorFX is a reliable broker. Although I haven't reached a year in this broker yet, I have seen their efforts to fulfill clients' satisfaction and needs. First of all, they have a team of experts analyzing the market and providing daily analysis. This is helpful to all traders. Secondly, they offer many trading instruments and even the less popular pairs are actively traded. They also have dependable customer support who are available 24/5. As for deposit and withdrawal, there will be no problem since they have many payment methods. Mine is through Neteller and the transaction is very fast. I already withdrew $350 and I did not encounter any problem. I have use PriorFX for my trading broker since 2017 and I can said that the broker is honest and doesn't manipulate the prices on the market so I really recommend everyone to join trading here. Their platform works fine on desktop or Android even in the morning until midnight, and the execution is instantly as I make an order. For this almost a year I haven't ever had an issue with them like freeze platform, slippage or waiting for funds on my account. Their commissions are ok that almost 30% a side. Till now I withdraw profit from my account by Visa, Mastercard so I can make it anywhere and everytime and the money transferred timely. I prefer this broker so far and ttey surely deserve a 5 star rating! I am still trading in standard account with PriorFX because I think in this broker set account size is relevant to me as a trader who just have small capital. I like the platform, everything was smooth from trading to payment processors, for almost 10 month I join trading here I didn't experience any problem with them. I made my last deposit on Monday about $300 via UnionPay in about 3 hours after I made a withdraw request, the profit and the bonus is in my bank account. I had no problems doing it, am happy with their service and love this broker. I have a standard account with a first deposit 300$. I trade with short term positions and mainly after-noon, when the market is stable. The platform MetaTrader 4 has real time prices and good stable spread. My profit is close to 400$ a month, trading currency pairs EUR/USD and USD/CAD, sometimes also I trade gold. PrioriFx has a nice spread of EUR/USD on average 0.2 pips. I never had re-quotes and to withdraw was easy, with approval within 24h. I recommend this broker. I trade with PriorFx with a standard account in USD currency for a couple of months and till now I like their services. Is use also MyFXbook to copy trades sometimes. Usually I trade with them EUR/USD, USD/CAD, USD/JPY, USD/CHF. The platform MetaTrader 4 works fast in execution with real time quotes. My profit is on average 500$ a month. To withdraw is easy and the process takes 24-48h. I recommend the broker because has transparent policy fees. I am very thankful with this broker because, in a very short time period, I could earn my first profit. I joined it 10 months ago and I opened a standard account with $300 first. I put my first orders on EURUSD and the trading conditions were ideal to generate $100 in the first week. Also, after taking some online courses from this broker, I could learn more about risk management and new strategies about trading, which really helped me to improve as a trader. Definitely, I will recommend this broker to all my friends. Well guys, good to share with all about PriorFx when I was them for more than 1 year. I think it should be a great broker since I don’t have so much concern on the MT4 platform. First time, I have made a deposit of $250 via the payment system “ Skrill” and I think the process of transfer quite fast within 3 working days I get money credited into the trading account. Same goes to withdraw system also okay and not too much complicates. I trade on mini account with 1 currency pair to enhance and getting more profitable trades or on the other words is to focus more on single trade at this moment. In fact, recently I just gotten profit form EUR/USD pair which gave me $100. So far, still need improvement in trading strategy and wish more successful trades with PriorFx!! PriorFx offers quite good trading conditions, their spreads for majors like EUR/USD and USD/JPY are no more than 1.6 pips during trading time, for me is one of the most competitve ones. I tested their MT4 OnMac, and execution is fast no more than 3 secs. The deposit I made of $300 via credit card was in my account and in 24 hours was in my account. Ransparent broker that listen to the cliente. PriorFx helped me with their tools to know better the market and my limits. I work with them since may 2016 and at the beginning I was a newbie, their staff helped me a lot with the right support and tools so that I had profit really fast, at 3 months I started to make alone the decisions without an EA and my profit increased constantly. I make now more then 1000$ a month trading Oil, Gold and currency pairs. I have a standard account and I deposited 300$ as first deposit, since then I had 0 funds only one time, and that is because I took to much profit out and I let the account with 500$, which I lost eventually, since then I keep in mind to have more funds in my account so that I could trade bigger volumes. I use now one EA which is helping me during the night sessions when I trade only EUR/USD. I recommend the broker, is transparent. I am so thank to my friends who has introduced to me about Priorfx and it has been 8 months with this broker. Before this, I also have tried few numbers of brokers and lastly I found them through the internet. At early stage, I traded on stock market and put a deposit of $300 and at the same time I run on currency pair market as I wish to double up the profit income. As a normal trader, I can’t avoid the losing trade and now more comfortable to trade on currencies market only. EUR/USD is most desired currency pair and I will focus more on it to ensure more profitable trades rather that opened multiple trade market. I thinks Priorfx spread is tight and still okay as it offered very affordable price at 0.1 pips for most desired currency market. In fact, sometime there was re-quote happened but it is not oftenly repeated which I think it is considerable if compare to other forex broker. Thanks Priorfx! !